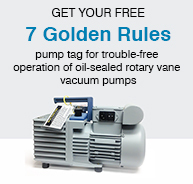 Send me a “7 Golden Rules” pump tag for my rotary vane pump. Problem: Vacuum pumps are laboratory workhorses, providing the conditions needed to run many lab applications. Unfortunately, pumps are also exposed to acid or organic chemical vapors that can cause some real maintenance issues. Particularly with oil-sealed, rotary vane pumps, the exposure of the oil to the chemical vapors can cause the oil to become corrosive, or to break down and no longer serve its vital lubricating function. Regular oil changes are needed to protect the pump. Beyond regular oil changes, what can you do to keep your lab vacuum pump operating reliably for years? Using oil-free pumps whenever possible is a good starting point. Most lab applications – filtration, aspiration, rotary evaporators, ovens, concentrators, gel dryers – are actually better served with chemical-resistant, oil-free diaphragm pumps, which provide vacuum at an appropriate level and require less maintenance. Some applications need the deeper vacuum that only an oil-sealed rotary vane pump (belt-or direct-drive) can supply, however. For these applications – most commonly freeze dryers, molecular distillation and Schlenk lines –oil-sealed pumps may be your only option. Solution: Follow the Seven Golden Rules of Vacuum Pump Maintenance, and you can reduce service interruptions and help your pump last a long time. Rule 1: Read your manual and check the oil regularly. Can’t find the manual? Most manufacturers’ manuals are available online. Download the manual and review it for operating and service recommendations. Then change the oil according to the manufacture’s schedule or if it looks dirty or smells bad. Rule 2: Warm up the pump with the inlet blocked. By running the pump for 20-30 minutes with the inlet blocked before connecting to your vacuum application, fewer vapors will condense in pump oil. Consider installing a manual valve in-line to simplify warm-up. Rule 3: Never block a pump outlet. Blocking the pump outlet, at best, will cause the pump to stop. At worst, the overpressure condition in the pump may loosen the seal around the oil sight-glass, causing it to leak and need repair. Rule 4: Use an inlet cold trap to protect the pump from corrosive vapors. A cold trap at the inlet both protects the pump from corrosive vapors and reduces the vapor load on the pump, so it operates more effectively. Make sure it is cold enough for your solvents, using liquid nitrogen, for example, for very volatile solvents. Rule 5: Use gas ballast (continuous purge) when working with condensable vapors. Gas ballast on a vacuum pump uses air to boost condensates through the pump to the outlet, purging some of them from the oil. For applications with high vapor loads and corrosive gases, a hybrid pump (combination rotary vane/ diaphragm pump) will keep the oil reservoir under vacuum, continuously distilling vapors and aggressive gases out of the pump oil, reducing corrosion and greatly extending oil-change intervals. Use an inlet separator to keep abrasive particulates out of the pump oil and rotating mechanism. Test for particulates by rubbing a little oil between your fingers. Consider an inline oil filter to extend oil lifetime. Rule7: Run the pump after use to purge solvents from the oil. After the application is complete, block the pump inlet, open the gas ballast and run the pump for a few minutes before shutting it off. By operating the pump near its ultimate vacuum level but with good air flow, many solvents dissolved in the oil can be purged, reducing internal corrosion during shutdown.